In 1956, the first A&W drive-in restaurant in Canada opened on Portage Avenue in Winnipeg. 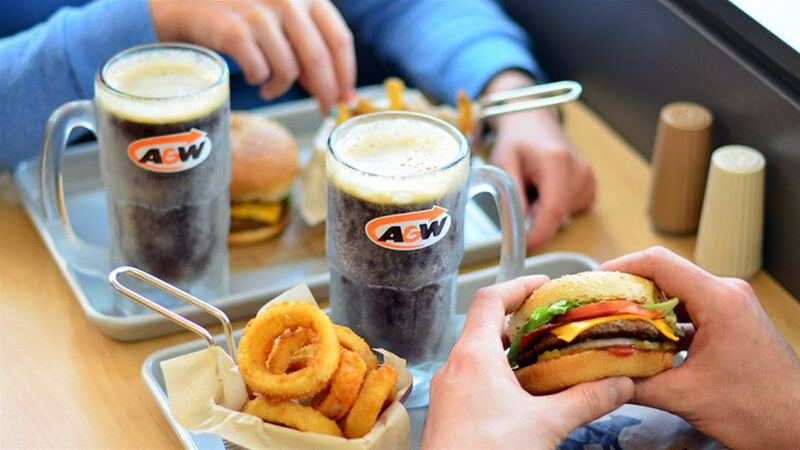 Serving a delicious combination of great-tasting burgers, onion rings and frosted mugs of famous A&W Root Beer®—all from the smiling faces of friendly car hops—A&W proved to be an instant hit. A&W Restaurants quickly multiplied across the nation, flourishing through the late '50s and '60s. In many communities, A&W was the first nationally branded restaurant in town. Because we were there first, our drive-ins served as “the place to be” in town. In fact, millions of Canadians today still carry vivid memories of special moments in their lives that took place at their local A&W drive-in. Whether they were kids in the back seat of the family sedan, or just hanging out with their best friends on a Friday night checking out the hot cars, Canadian baby boomers grew up with A&W. It's an enduring friendship that is the source of A&W's continued success across Canada. Since then, A&W has continued to grow, expanding into over 700 locations from Vancouver Island to Newfoundland. At the heart of that growth is the fact that, while so much of our world has changed, the simple things that made A&W so popular in its early days are the same today. We still serve A&W Root Beer® in frosted mugs. Our onion rings are made fresh from whole onions every day. And our Burger Family burgers are still made with fresh, quality ingredients and served in our classic foil bags to keep them hot and tasty every time. While our commitment to having the best-tasting food hasn't changed, our restaurants are dramatically different than they were in the drive-in days. As our customers' needs for convenience and faster service grew, our restaurants changed to meet those needs. The drive-ins of the '60s have been replaced by contemporary free-standing restaurants with drive-thru service. We've also expanded into new, more convenient spaces. In shopping centres, airports, and highway gas/convenience locations, A&W is more accessible than ever. So is our famous A&W Root Beer®. A&W remains Canada's No. 1 brand of root beer and is available not just in our restaurants, but also in cans and bottles at your local grocery store. With a rich history behind us, we look forward to an even more exciting future ahead. A&W is expanding all across Canada, and we're always looking for new team members. For restaurant or corporate employment opportunities, please visit our ‘Work at A&W' page. Or for more information on becoming an A&W franchisee, click here.